When I suggested Greece for this year's out of country vacation, I had no clue what to expect. I remember seeing a photo of blue skies and white buildings and thought it would be fun wandering around a place with such a mystique. Stunning architecture gets me every time. What I was introduced to when we landed at Athens Airport was a familiar but distant way of life. The people, open. The food, Mediterranean. The weather, hot. Here is a visual diary of our travels. 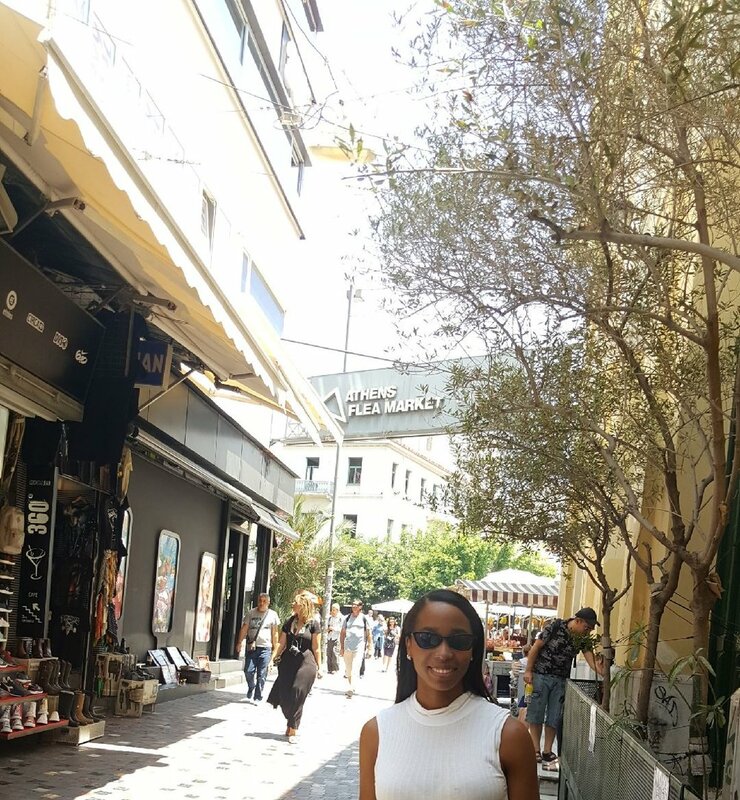 Our Athens Airbnb was tucked away on a small street near several restaurants and a 15-minute walk to the Monastiraki Flea Market and the Acropolis. The newly renovated modern apartment had everything we needed for our short stay in Athens. The best advice I was given while touring the market, "watch your purse, there are magicians around here." We road to Mykonos Island on a ferry ride I could have done without. Two hours later we arrived at the port greeted by our new host Panos. He informed us about the small island, its beaches, restaurants, and the markets nearby our cabin-style dwelling. The significant part about Pano's property was a small private beach that could only be accessed from a rickety gate off the roadside. But once through the gate the homes and the views on this side of the island were spectacular. I'm standing on top of the roof for this shot, you're welcome! After saying goodbye to our Santorini host, we headed back to Athens for our return flight home. We had a few days to check out the Acropolis Museum, a rare Thai restaurant with a chef who studied in Thailand and picked up food and trinkets for the return trip back to Dallas.